Sir.—I notice in your issue of 16th January, a report of the capture of I my son, F. H. Thomas, and the misdeeds he has been carrying on for the last 12 months or perhaps more, and I must say it is very true, but I regret that the report is just as one sided as it is true. Nothing more or less I would say than a police report. Its a pity we are always too ready to throw dirty water on each other. We often place scorn where pity should be fitted. Now, Mr. Editor, I must ask you to allow me a small space your esteemed columns to try and throw a little Christian light on this matter. Now sir, as I have remarked above, my son has been carrying on this thieving game for 12 months or more. In the first part of his little game he was only mild but as the police put some restraint on his behavior he got worse and worse in his extravagant pursuits, taking horses four or times a week, jumping trains, emptying goods out without any advantage or gain to himself any more than to get a bit of food. He even came at night and took a horse, saddle and bridle from me and very often came home at dead of night and took food from the safe of his own home whilst a fond mother lay within that would walk over an acre of hedgehogs in her bare feet to give him food had she known he was hungry. I went to I see my son just after the police got him. He was in a terrible state, and I asked him why he did not come home, he replied, "What's the good of going." I asked him would he not like to see his mother and he replied, "She is no good." Now sir, I think most of the people of this State will admit that the above is a true and real worded picture of a person out of his mind and this is the picture of my unfortunate son, F. H. Thomas, who was sentenced to two years hard labour, and without any Christian remark. He admitted all things that he did and perhaps things he did not do. In fact it was just like trying a child two years old, but I hope the people of this district do not think that I am of the opinion that my son should have been set free, not at all, he would certainly have gone on in the same old way. But I do think he should have received other treatment. Now that the authorities have possession of him its to be hoped they will give him such treatment as will make up for what was lacking at Three Springs, and I believe they will. It is said every mar is an asset to the State. He is a fine man and worth a little trouble. I must add my son has been very peculiar all his life. Maybe the complaint is coming to a head now and on the turn to recovery and I hope he will get such treatment as will help him along in that direction. Trusting you will publish the above and thanking you in anticipation. I am yours etc., F. H. THOMAS. Coorow, 20-1-1920." The career of the Kelly gang and their decline and fall, is a memorable episode in Australian history, but the chronicler of Australian bushranging may find almost equally excellent material in the exploits of Francis Henry Thomas. On May 23 this man effected a dramatic escape from the Geraldton Gaol, where he was awaiting trial on charges of theft. As soon as he was clear of Geraldton Thomas, who is a brilliant horseman, executed a number of raids on camps pitched at various points between the Wongan Hills and Midland railway lines, stealing valuable horses and considerable quantities of stores. On Friday last he was recaptured by the police at Perenjori, and was being escorted to Geraldton when he again escaped custody, near the township of Buntine. 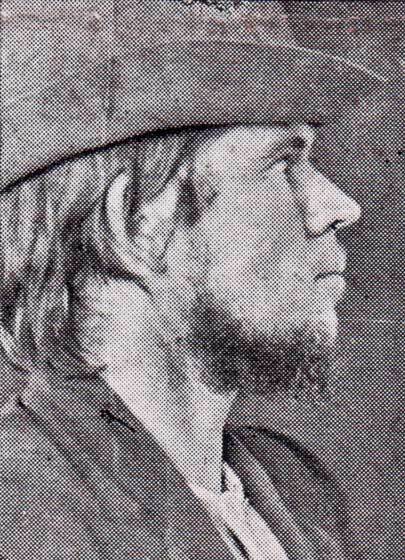 Chief Inspector McKenna has now received information that Constable Wreford has followed the man's tracks to a point eight miles from Perenjori, and that police parties from Three Springs, Goomalling, and Mingenew are searching the district in the hope of discovering the hiding-place of the fugitive."